It’s do or die for India today… Australia have already qualified for the final, but if India don’t win today, their chances of making the final on Sunday in Perth will be all but gone. Massive crowd making their way into the Sydney Cricket Ground, but we don’t have good news for you off the top here… like most of the state, it’s damp, the covers are on, but the long-range forecast is good, and we should get some cricket on this iconic day, so hang in there with us this afternoon! Hello everyone. Welcome to the Sydney Cricket Ground, and happy Australia Day to you all, and also Happy Republic Day, to those of you following the coverage from India. It’s the National Day for both countries, which makes this event a special one every time it’s held, in either Test or ODI form… the last time these two met on this day, was on 2012 at the Adelaide Oval, as part of the 4th Test in that series, which Australia won 4-0. We will get Cricket this afternoon, according to the curator, Tom Park, so hang in there with us… will have more news when we have it from the Sydney Cricket Ground! 2:35pm | We have great news from the Sydney Cricket Ground. We’ll have the toss at 2:40pm, and play from 3pm AEDST! 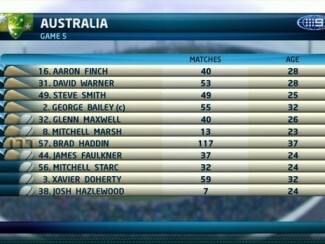 So, we shouldn’t lose any over… it’ll just mean a later finish tonight at the SCG! Hello again from the Sydney Cricket Ground, where Australia have won the toss, and, no surprise, given the conditions, have elected to bowl first. It’s a fantastic atmosphere here… the Indians, the swarmy army are all in, and partying hard, and the ground is starting to fill up. We’ve got play from 3pm AEDST. We haven’t lost any overs yet… we will if we get any more delays you would dare say. Plenty of changes to BOTH teams… take a look at that. We’ll be back real soon with LIVE play. 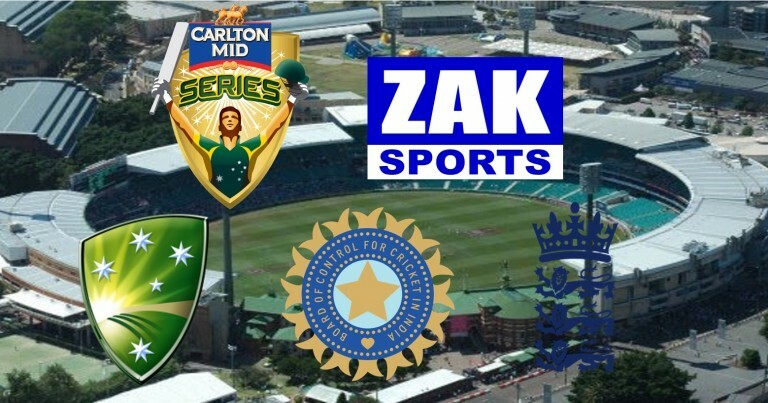 The news is that George Bailey has won the toss, and has sent India into bat. We’ve been delayed, but finally, some 40 minutes after the scheduled starting time, we’re about to get underway at the Sydney Cricket Ground. George Bailey won the toss, elected to bowl first… plenty of changes to the Australian team, with Warner, Bailey, Mitchell Marsh, Hazlewood and Doherty all coming into the side, which means a significantly different, but probably stronger team than the one that got home, chasing 300 against England on Friday Night. We’ve had the anthems… Players and Umpires have made their way to the centre, and a very healthy crowd have taken their seats at the SCG, and we’re PUMPED! As we go up to the Commentary Box, and say hi to David Lloyd, James Brayshaw and Michael Slater! 3:15pm | AND… WE’RE GOING OFF! The rain has returned to the Sydney Cricket Ground… and the covers are going on to the pitch. It’s going to be one of those afternoons here at the SCG! 4:02pm | Hello again from the Sydney Cricket Ground… we have some news for you in relation to this current rain delay. The rain has stopped… the covers are off, and if they stay that way, play will resume at 4:06pm AEDST, but we’ll be reduced to 44 overs per side. 4:06pm | We’re back on ground at the SCG, but we’ve lost overs… it’s a 44-over side affair from this point forward, unless of course, we get mor rain. 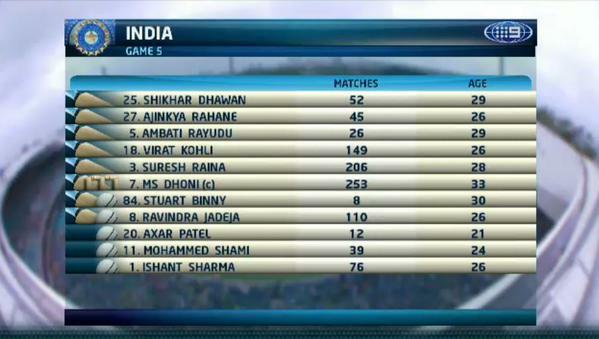 Dhawan and Rahane will resume for India. Mitchell Starc has the ball in hand, and waiting for us in the Commentary Box… they’ve been there since 3pm… it’s David Lloyd, James Brayshaw and Michael Slater! 4 bowlers can bowl 9 overs, 1 bowler can bowl 8. GOT HIM… DHAWAN IS OUT, CAUGHT IN THE SLIPS AGAIN… HOW MANY TIMES HAS IT HAPPENED THIS SUMMER? GONE!!! GOOD RUNNING CATCH FROM DAVID WARNER, AND THE PARTNERSHIP IS BROKEN! So, the dangerous player of this partnership is gone, but now that brings Virat Kohli to the centre, and to tell you more about it, Michael Hussey, Mark Taylor and Ian Healy! BAD NEWS… Yep, it’s raining again at the SCG… we’re going off again. 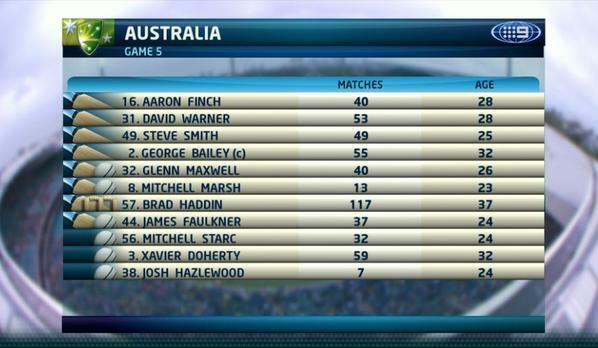 India are 2/69… going along at a little better than 4 an over, but it’s a frustrating afternoon at the SCG! More news from here a little later on! It’s Australia Day at the Sydney Cricket Ground… It’s Australia and India in Game 5 of the Carlton Mid Tri-Series, but it’s also wet… and that’s put everything on hold, and caused teams, umpires, spectators and all of us quite a bit of frustration… the rain continues to fall, and it’s a very depressing scene. Hello again everyone… It’s not what we wanted today… the weather gods haven’t been on our side, and this game of cricket is at a standstill. The game was originally delayed by 40 minutes, and we got underway at 3pm… and were back off after just 2.4 overs. It was a lengthy delay, of nearly an hour, and then we were back on at 4:06pm for around 50 minutes… but, we’ve been off ever since, and there’s some doubt as to whether we’ll get back on at all. For us to complete a 20-over a side match, which is the minimum requirement in ODI’s, we’d need to be back on by (roughly) 8:45pm AEDST… India would have 4 overs left in their innings, then Duckworth-Lewis would come into play, and Australia would be given a revised target, and 20 overs to get the job done. However, if we end up being washed out, both teams take two points, and Friday’s match in Perth between England and India becomes a MUST win for both teams, if they’re to qualify for the final against Australia. That’s then is the news, and there isn’t much more to tell you. We will continue LIVE coverage if there is any play. Truth be told, I don’t think there’s too much chance. So for the moment, we will just resume normal programming. Bye, bye from the Sydney Cricket Ground! Good evening everybody. This should’ve been the evening session in the 5th match of the Carlton Mid Tri-Series, but NO CHANCE… the rain has been constant in Sydney since 5pm, and the match has now officially been abandoned. India were 2/69 after being sent into bat by George Bailey, but the wet weather in Sydney has played it’s part with a delay to the start of play, and two subsequent stoppages to the game… and, our worst fears became reality a few moments ago, with this latest stoppage being terminal… Unfortunately the conditions in Sydney are quite damp, and the overhead conditions are grim and murky there’ll be no more cricket tonight… it really is a depressing scene, and a sad way to end this great day on the annual calendar. Frustration for all of us, but it means that the game in Perth on Friday becomes a Semi-Final effectively, due to India picking up two points here for the No Result. It now means that both sides MUST win that game to qualify for the final against Australia. 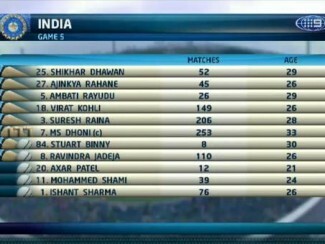 The equation is simpler for England though, as a win, washout, or tie would see them into the final. You’ll see it Friday on GEM, and don’t forget, the Allan Border Medal is on tomorrow night too. 8:30pm (Local Time) on GO! So, that’s it then. Bad news from the Sydney Cricket Ground. From me, on Australia Day, a very goodnight to you!